First off, there was a cinnamon roll involved. We all have our motivations, they change over time, but I wanted a cinnamon roll. From home to office it is about 33 miles. That can vary depending on the route, but that is the shortest distance possible. Over the past month I have not had time to run more than 20 miles a week. Even that is pushing it. Between increased responsibilities at work, new schedule involving me driving youngest child to school/daycare each day, and taking on additional projects, running time has become scarce. For what I have planned over the next 6 months, I need to be running 50 miles a week. The idea came to me that I needed to test where my endurance was currently residing. My wife and 3 oldest kids were on spring break, which freed my morning of dropping off our youngest. I had no morning responsibility for the first time in 3 months. Rather than sleep in, or sleep at all, I decided to run. The plan: Leave my house at 11p and arrive at the office by 6a. Logistically, there is a side road that follows the highway all the way up to my exit. I live .4 miles from that road, so my thought was to take that road all the way up. I drive the highway everyday, so for the past 2 weeks I had been watching the path carefully. I knew there was at least 2 miles that I would be on the highway running. Well, I could have followed the side road, but that would take me 3 miles out into a dark flat land that horror movies are made of. I calculated that it would be about midnight at this point which meant not as many cars on the highway. Go for it. Heading down the road, the weather was much more pleasant then expected. It was about 44 degrees with a light breeze. I didn’t have gloves thinking that if it got chilly, I would just pull my hands inside the long sleeve pullover. That wasn’t the best idea. Running along the highway, there is not much to block wind. Plus, the vehicles going by at 75mph did a great job at producing additional wind. You wore reflective clothing or a vest, right? Actually, I work all black. I did have my white SunRype hat on with a headlamp, so that counts as reflective. There are times when I think being a bright spot on the side of the road makes me more of a target. As long as I am aware and see them coming, I feel more in control. The first hour of running surprised me when looking at my pace. I was hitting about 7 miles/hour. A pace I knew wouldn’t last much longer. Based on my training for the past month, I knew I had a good 10 miles in me and the rest would be mental training. Another benefit of this run would be to experiment with nutrition. At mile 8 I had a Honey Stinger Chocolate Gel for calories and electrolytes. It didn’t sit well with my stomach. This confirmed what I had been wondering for almost a year: Gatorade and anything else doesn’t work for me. In my Hydrapak I had 30% Gatorage and 70% water, so that it wouldn’t be so sweet. Next test will be just running on water and Honey Stinger Gels. At the halfway point of the run is a truck stop called Johnson’s Corner. They have 2 large billboards I read to and from work each days proclaiming “World Famous Cinnamon Rolls!” Taunting me to stop on my drive. Every. Single. Day. This was my only scheduled aid station. Get here, get a cinnamon roll and coffee, keep going. I entered the store, quick bathroom stop (luxury! ), and over to the counter. It was becoming clear that I was starting to lose it. Quick math said I had burned 2,200 calories and consumed 250. That doesn’t end well as I have learned. 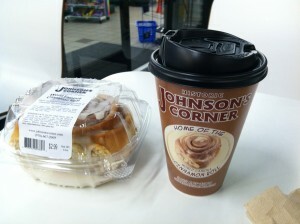 Very nice guy at the counter asked what he could get me … cinnamon roll and coffee. Done! I decided to sit down at a table and take 5 minutes to consume this delight. Come to find out, I couldn’t move my fingers very well. They were frozen. I knew my hands were a bit stuff, but assumed it was from the blood leaving them due to running. Come to find out, it was now 35 degrees outside. Combine that with wind and you get really cold body. Sitting there, I managed to move hands enough to get bites down. The thing was bigger then my mouth. (Wow I hear your jokes from here!) The coffee was pretty hot, so decided to use that as more of a hand warmer on the run. I have never run with coffee, but figured what else is there to do at 2:30 in the morning running alongside the highway? It took about 3 hours for the first half of the run, so I was expecting an extra hour for the last half. Normally when I stop on a race, having much consistency running after that is tricky. Heading back out onto the road, I kept moving the cup of coffee back and forth between hands for warmth. This was a fancy cup like you’d get at McDonald’s with tab to cover the drinking spout. I go high class. If it didn’t have that, there’s no question it would have covered my hand. About half a mile from Johnson’s Corner, I was finding my rhythm again. Walking up the grass was a man that either had just woken up or was stumbling from town to town. There were no houses, parking lots, or anything for miles. “Good morning!” I yelled just as I was getting ready to run past him. “Woah you’re running …” he stated/questioned/concerned. He was clearly not expecting to see a guy dressed in black, spotlight on head, carrying a cup of coffee, running down the side road of a highway at 3am. Continuing on down the road 3 miles, it was time to switch over to the west side of the highway. For the first 20 miles, I was on the road on the west side of the highway as it was the most consistent. Up ahead was the Outlet Mall, so I could follow a road to add another 3-4 miles, or take to the highway. At exit 257 I crossed over the highway on the bridge. That was pretty cool to be standing over the highway with the stars shining above. Took a moment to take it in. The plan for the next 2 miles was more highway running. From what I could tell on my commutes, there really wasn’t a side road to run on. To my surprise, I found a dirt road that took my farther than expected. I made it a mile before coming to one of those forks in the road. I could go left and see where the nice paved road takes me, or go off-roading through the dark field ahead. Of course, I took the dark field. There are times when it is good to have an active imagination. This would not be one of them. As I started running through the field, the highway on my right raised up into a bridge. That meant nobody could see me running through the dark field at 3:30am. I came across Amtrak railroad tracks that had large piles of dirt. I don’t know what the purpose of those piles of dirt are. The vision in my head was from an episode of CSI where someone jumps out and takes me down. Great motivation to run faster. Looking at the data from the run, there is a clear increase in speed in this area. After making it over the railroad tracks, there was a nice dirt road that followed alongside the highway until Exit 259 where I picked back up on a paved road. I coasted down a good portion of the hill into the last uphill. At this point I was in a run/walk strategy that was averaging out to 12:30min/mile pace. That is acceptable for an ultra … and virtually no training. At Exit 265 it was time to be done with the highway. I sent a text message (5a) to my wife to let her know I was getting off the highway and enjoy the last 4 miles. The sidewalks in town do not go in a straight line. After a mile of following the zig-zags some landscaper thought would look nice, I decided to become a bicycle. One of the great benefits of Colorado is that we have bicycle lanes in almost every town. With feeling the 3,000+ negative calorie impact, I took to running in these lanes for the straight shot to the office. My Monday in the office consisted of eating a large burrito, meetings, donuts, eating chicken wings, more meetings, donuts, and eating at Olive Garden with my family. I was able to keep my eyes open until 8p when I gave in and slept for about 9 hours. I expect to be doing this run again. With an ultra and marathon coming up shortly, I probably won’t do this run for about 2 months. This is good training for the Leadville 100 Mile Run with regards to running on tired legs at night. It was a good time and hope people go donate to JDRF and check out the Kaiser Permanente Colfax Marathon! You are CRAZY!!! Ahem. This may be my favorite post you’ve written! Congrats on making it to work! Thanks Mandy! Hope your training is going great!